Black Mold Testing ..........Do Home Test Kits Work? If you think that you have a mold problem in your home, it is important to do black mold testing as soon as possible in order to determine how severe the problem is. Some people try to use home mold test kits in order to save money because they don’t want to pay a professional, but the problem is that these do-it-yourself kits are often inaccurate. Typically, a mold test is performed at the beginning of the cleanup process in order to determine how severe the problem is. The most important testing occurs once the mold has been cleaned up, in order to determine that all of the mold spores have been removed. It is possible to do the mold cleanup on your own, but if you choose to proceed with the project by yourself it is suggested that you still work with a professional who can advise you on the mold levels within your home. A professional mold tester has highly specialized equipment for black mold testing, and they will be able to locate where the mold problems are and how much it has spread throughout your home or building. The problem with black mold test kits is that the user has little to no training on how to use the test correctly, and these cheap kits won’t always give the full picture of the mold problem they are experiencing. Many people find themselves in a difficult position, because they attempt to clean up the mold without really knowing the scope of the problem, and then use an at-home kit to determine whether or not the problem has been taken care of. These kits do not always detect mold that is present, which means that you may be misled by the results. Even though the kit may report that there are no mold spores present, there actually may still be a problem within the building. And any mold spores that are still present can cause negative health effects on anyone who is exposed. The best way to verify the presence of mold is to hire a professional that can bring in high quality equipment and expertise. Their testing procedures are very rigorous, and they can detect even small amounts of mold spores. Once the mold has been cleaned up, they can then come back again to verify that all of the mold has been properly removed, and that there are no more mold spores in the property. Another benefit to using professional mold testing is that many homeowners insurance policies cover this type of testing. But, do-it-yourself mold test kits are typically not covered by insurance. In fact, some policies will require a professional testing service in order to verify that the mold has been cleaned up correctly. If you choose to have a professional company take care of the mold cleanup process for you, it is still a good idea to bring in an independent company in order to do the testing. Hiring a company with no vested interest in the cleanup process will ensure that you will get unbiased and accurate results. For example, if the hired cleanup professional does the testing on their own, they may tell you that the job has been completed in order to avoid additional cleaning. 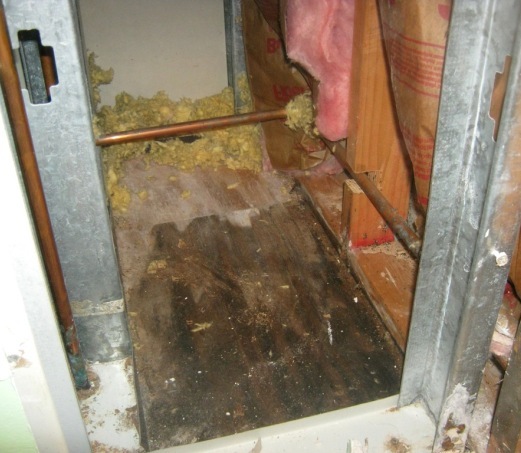 There can be some advantages to using black mold test kits, but remember that the results are not always accurate. The best way to verify that the mold is gone is by hiring a professional that can bring in their high quality mold testing equipment. They will test areas throughout the home to determine that the health of your family is safe. Expect a highly-trained professional. Most professional mold testers are actually engineers. Expect him or her to test for mold on various household surfaces as well as testing the air quality in your home. Expect him or her to tell you what strain or strains of mold are present and which of those are considered toxic or hazardous to your health. Expect him or her to provide you with a written mold removal protocol that includes safety precautions. Expect him or her to return after you’ve completed the cleanup process to retest for mold in order to make sure the job was done thoroughly. To locate a professional mold tester near you, click here. Air sampler used by professional mold testers. Mold found under central air conditioning unit after testing indicated the presence of black mold.